FDInspiration Antique Verdigris Finish 3 Tier Fountain Bird Bath Pedestal Garden Decor w/Pump Recirculation System | Fountain City Art Ctr. 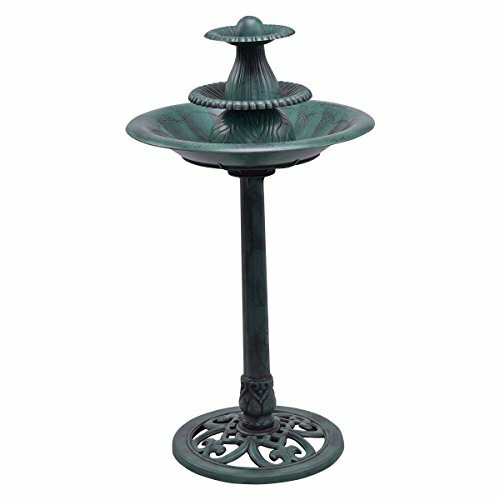 This is 3-tier bird bath fountain with durable construction and its antique verdigris finish will give a deep impression. Including a pump which uses a self-contained water recirculation system, it saves water and the gentle trickling sound will transport you from your backyard to the serene countryside. It is not only a fountain but also can as a bird bath .It is perfect for your garden or patio, and provides visual and auditory beauty for it .